Who does not like some sushi? 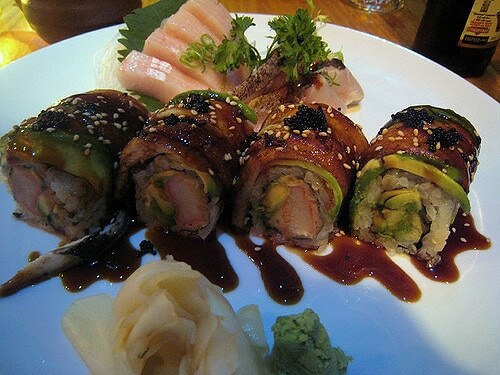 Let me present you something even better -The dragon roll sushi. This one roll offers you so much in a single bite; no other Chinese recipe could ever guarantee. There were a couple of times when I heard my Chinese colleagues talking and almost bragging about this loaded shrimp tempura roll. And having heard about it many times, I eventually asked one of them to share the taste of it with the rest. And the minute I took that first bite, I was standing on the ‘bragging about this sushi roll’ side of the story. Not ever in my life, I had experienced such a unique mix of ingredients. And as lucky I found myself having to taste the goodness of a dragon roll, I went more fortunate by getting a super easy recipe of the spicy dragon roll. Since I had already tried making sushi at home a couple of times before, it was so quick and easy for me to prepare a dragon roll in no time. However, those who haven’t tried the wrapping of the rice layer and stuffing of the nori seaweed before should consider watching some tutorial on its handling techniques and then better get started with the actual recipe. It is all about nice packing of the roll and the perfect layering which makes these rolls more presentable and appealing. A nicely packed and squeezed roll is also easy to slice for the serving. Another reason of why I am sharing this recipe with you all is that this sushi, in particular, does not need some raw sashimi scale fish for the stuffing which is not mostly loved by the small children or pregnant ladies. Rather it is stuffed with next level shrimp tempura! This is part of this sushi which gives you the crunchy dragon roll. The great tempura is a dish in itself and if you are not familiar with the recipe then don’t worry! A part of my article will discuss everything about shrimp tempura so that you don’t miss anything delicious out of the classic dragon roll recipe. There are several ways of making this roll; I will try to give you the best taste with the easiest techniques. In my opinion, it is always better to add more stuffing to the sushi, while you are putting so much effort into its making. What is A Dragon Roll? Anyhow, the roll is known as the ‘inside out sushi roll’ meaning, instead of having rice stuffed or layered inside the nori wraps like most of the sushi rolls, the rice are layers of the nori wraps. The changing of the position of the layers does not affect the taste, but it sure makes room for the super delicious shrimp tempura in the inside. The tempura is packed with lengthwise, sliced cucumber. And what more exciting is that you can also add some grilled unagi inside. That nicely avocado slice covering over the top of the sushi gives a refreshing green color to this roll. Therefore, it also goes by the name green dragon roll. People change the recipe as per their taste preferences, often tempura with crab meat or use chili or sriracha sauce for seasoning, but nothing there is not a replacement of the avocado topping in this recipe, and it is the single most nutritional ingredients of the dragon roll. Then comes the cucumber in the stuffing, which gives the sushi a juicy green color on the inside. With the aim of listing down all the dragon roll ingredients, I will also be sharing how to prepare those things. I hardly recommend the market bought sauces or the stuffing; it is always best to add the homemade freshly cooked ingredients. 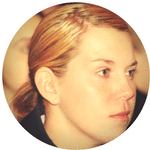 If there are time constraints, you can surely look for the store-bought ingredients. Most of them are available in Asian or Japanese stores so those are places where you should be heading. Running from stores to stores is not an effortless job, so I bring all the sub-ingredients to prepare things like unagi sauce and shrimp tempura and does not spend a minute searching for the readymade items. It turns out to be far more economical and healthier. One bottle of unagi sauce made in a single session can be used for 3 to 4 weeks. 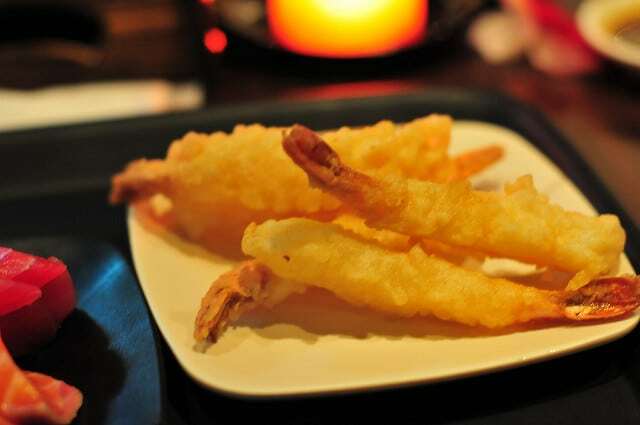 Same goes for tempura; if you preserve the coated shrimp, they can be used even after 2 to 3 weeks. Frozen shrimp tempura is readily available in all big American grocery stores. they are a good alternative to the homemade ones, as the shrimps are already coated with the crunchy mixture and you only need to bake them for 20 minutes for more until they are al dente. To make the tempura first mix 1 cup all-purpose flour with 2 tablespoons cornstarch, 1 pinch salt, 1 cup water,1 egg yolk, 2 egg whites, lightly beaten in a large bowl and then toss in 1-pound medium shrimp, peeled and deveined. Once the shrimp are coated well. set them aside. Meanwhile, add 2 cups vegetable oil to a deep-frying pan. After heating the oil well, gently and carefully place the shrimp in the oil and deep fry them until they turn golden brown in color. Then immediately transfer them to a plate lined with paper towel. Let the towel absorb all the oil. 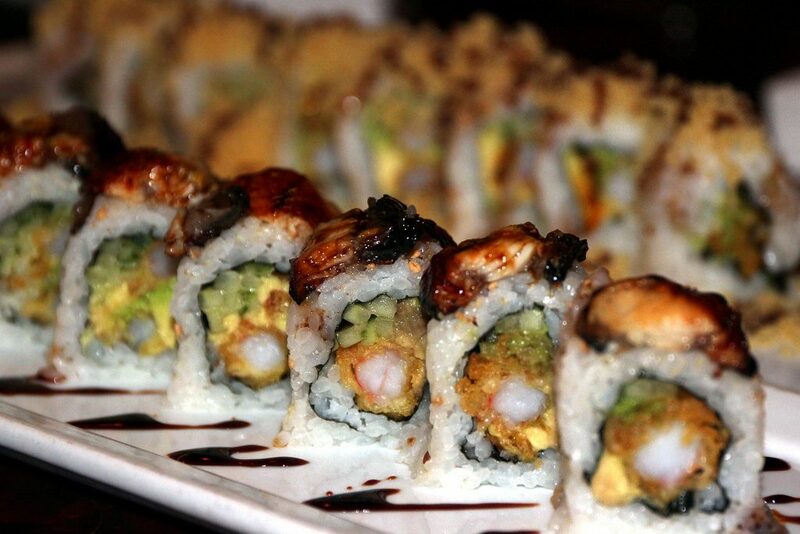 Your shrimp tempura is ready to stuff into the dragon roll. Make sure to take small size shrimp without tales to make tempura for sushi as it needs to rightly fit into the roll. As if the dragon roll is incomplete without the avocado slices. The recipe is all about finding the right avocado for the roll. Nicely ripe avocado slices can complement the taste and texture of the roll below. I happened to have this special store which provides the best avocado in town. Look for avocados with darker skin color and gently squeeze the fruit in hand. If it is firm and sustains the pressure, then the avocado is ready to use. You can bring them home. Let’s get to the use of the avocado. Do not mash the flesh to top the roll rather its slices have to be used instead. First cut the fruit in half and after removing the pit from the inside then peel off the skin gently. Now slice each half into thin slices. The size of the avocado slice is larger than the breadth of the sushi roll, so you need to cut them shorter into suitable sizes. Do not leave the avocado after slicing, as the flesh will lose its pretty green color, drizzle lemon juice over the avocado and mix gently. Then set the avocado aside until the roll is ready. Place the slices over the sushi and press them into the rice. For dragon roll, long and slender Japanese cucumbers suit the best. These cucumbers have very few seeds, so you don’t even need to remove them and use the slices as it is. If you can’t find Japanese cucumber, then Persian cucumber is another good alternative. Seedless cucumbers are used for sushi roll because they do not release excess water into the roll. So, if you are using any seed variety then make sure to remove the seedy part from inside and then add the slices to the roll. Not every rice is good for a sushi roll. Japanese short grain rice is the true sushi rice. In Japan, these rice are first steamed and then mixed with sushi vinegar for seasoning. After the steaming, the rice comes out softer and steaky then other variety of rice and thus they can be easily packed into the dragon sushi roll. I, on the other hand, use a different recipe to make the perfect sushi rice. 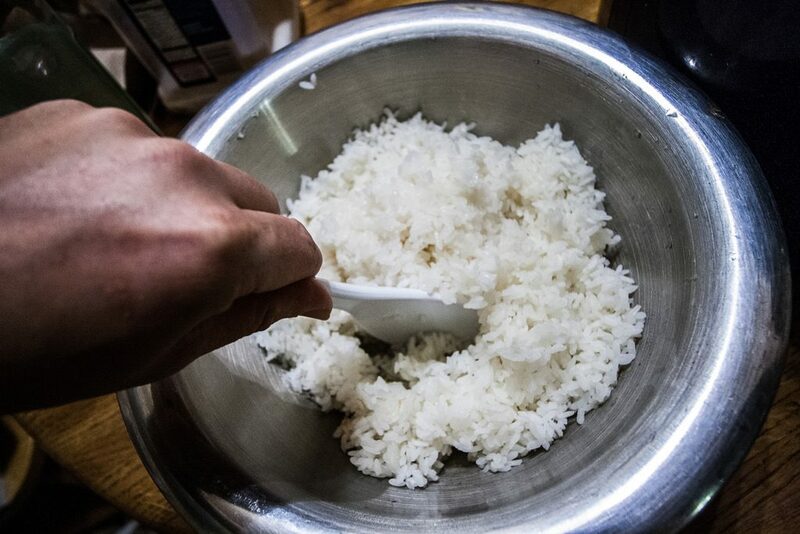 Take about 2 cups uncooked glutinous white rice (sushi rice) and 3 cups water1, /2 cup rice vinegar, 1 tablespoon vegetable oil, 1/4 cup white sugar and 1 teaspoon salt. 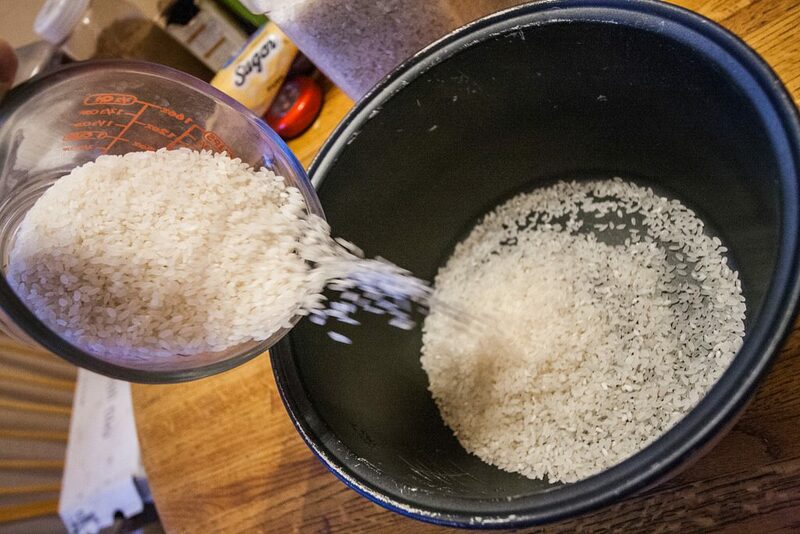 Now cook the rice in the water over medium heat until the water is completely absorbed. Meanwhile, stir cook the remaining ingredients for 2 to 3 minutes in a saucepan. Pour this sauce over the rice and mix them well. the sushi rice is ready to use. For dragon or any sushi roll, make sure not to mash the rice before putting over the nori sheet. Have you ever seen a mash in there? No! the rice kernel can be seen distinctly separate from one another. Adding too much rice to the roll is another mistake most people make. rice should be just enough to evenly cover the nori sheet in a thick and intact layer. Speaking of dragon sushi roll, how can we not talk about the seaweed sheets. It is after all these sheets used for the wrapping. The inside out sushi roll has the nori sheet inside and the rice layer on the outside. Select the size of the sheet as per the sushi role size. Cut off 2/3 of the sheet to make a perfect dragon roll. For the first try, take a ½ sheet of the nori seaweed and make a roll, change the size accordingly. This two ingredients sauce is one amazing combination and its that spicy tinge to the dragon sushi rolls. 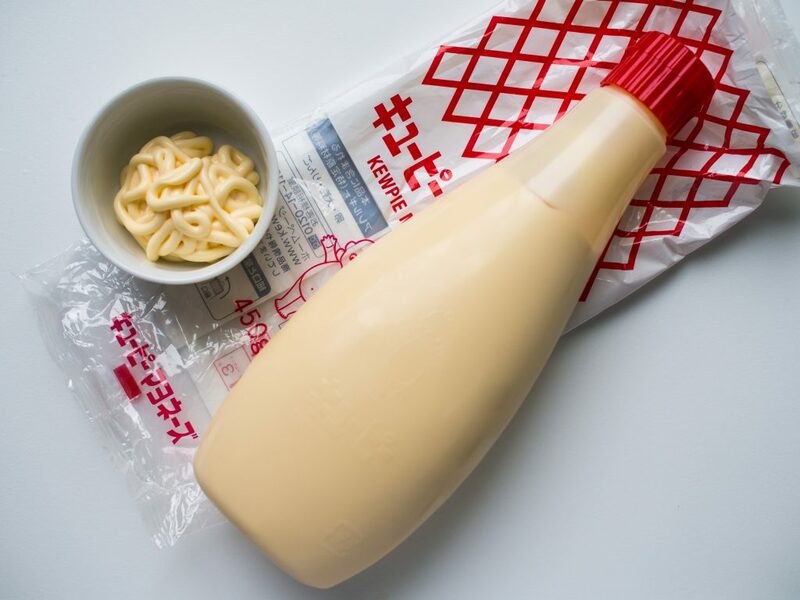 Having this mayo ready in your refrigerator is great since it can not only be used for the sushi rolls, but you can also add them to the potato salads, Caesar salad or pasta, etc. These days, season mayonnaise is readily available in different flavors. The one used for the dragon roll is different, however. It is smart to make it at home. for that, you need some Japanese mayonnaise and Sriracha sauce. For every tablespoon of mayo, you should add 1 teaspoon of sriracha sauce. Put them together either in a bowl or a mixer and mix them well until sauce is completely incorporated into the mayo. This will give you a light orangish mayo paste. Remember it neither have to be too tangy or too mild, you can change the proportions if desired though. 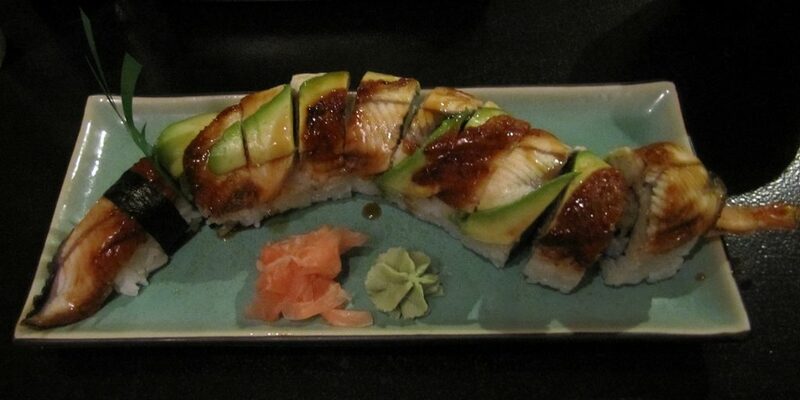 There is not much of a use of unagi sauce in the dragon roll, but you still need a tablespoon or more of it. 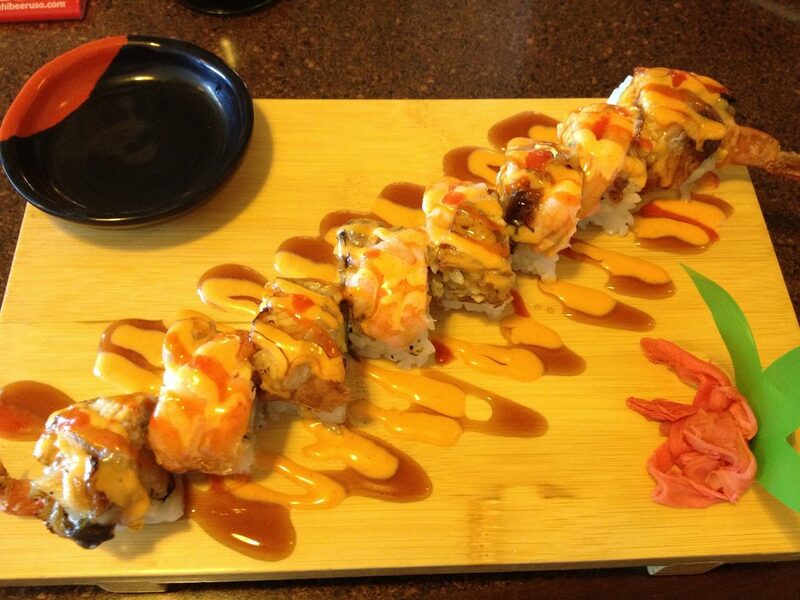 the sauce is drizzled over the dragon roll, and it infuses a unique taste into it. Unagi is a Japanese word for eel. This sauce is available in many Japanese grocery stores, if you still can’t find it then try this simple recipe and make your own unagi sauce from scratch. It only requires a few basic ingredients which are used in every other Japanese meal. Take about ¼ cup soy sauce, ¼ cup mirin, 2½ Tbsp sugar, and 1½ Tbsp sake. For more sauce, double the proportions but keep the ratios same or else it won’t taste like a perfect unagi sauce. First, start by mixing mirin with sake in a saucepan. Let them boil together until the alcohol evaporates. Then add the sugar in, stir cook the mixture until the sugar is completely dissolved. Boil the sauce again after adding soy sauce. Let the mixture simmer for 20 minutes on medium-low heat. Immediately remove the sauce from the heat and allow it cool. Now transfer the sauce to an airtight container and let it refrigerate for 2 weeks. Preserve this sauce in a cool and dry place. this sauce can be used for days if stored properly. 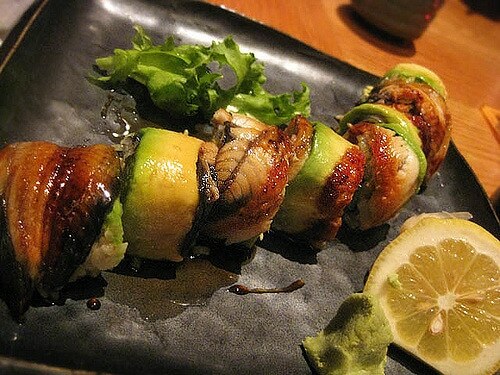 To make the dragon roll taste fishier and unagi like, sometimes, other than the sauce the eel itself is stuffed in the roll. Right, when tempura and cucumber are placed in the nori sheets, a small amount of unagi is add, and then the roll is packed. But not everyone is comfortable about eating the eel, so it is kept completely optional. First, give it a try, if you don’t find the taste suitable then don’t go for it the next time. Unagi can both be baked or steamed. After its fillets are cooked, dice it to add the pieces to the dragon sushi roll. The Super healthy Tempura Roll! 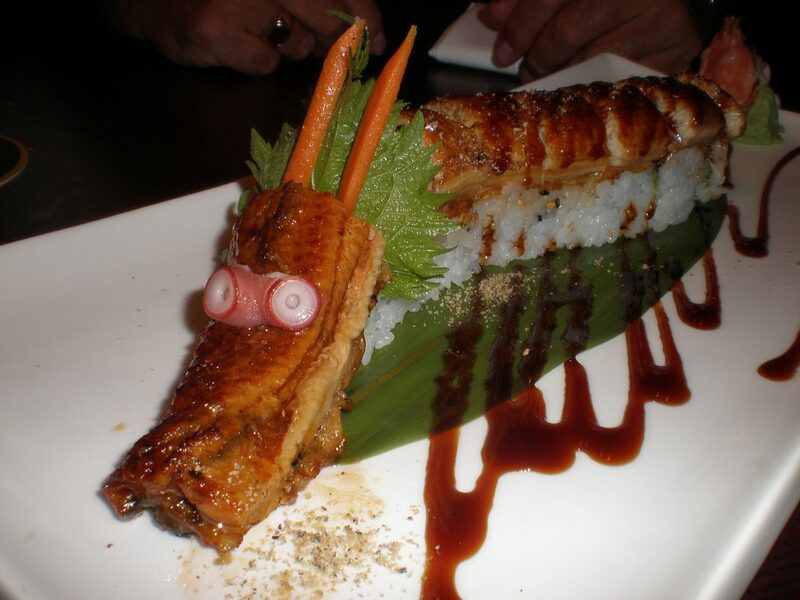 The culinary significance of the dragon roll can never be overestimated. It is loved and enjoyed in every street in Japan, and now it has become even more popular around the world. But besides good taste and appealing presentation, this roll is a gem of the healthy food world. Imagine how much of the nutrients every bite of it can provide. It has everything nutritious tightly packed in a single deal. From seaweed to seafood, rice, avocado, cucumber, and unagi, everything is in there to make it the healthiest sushi ever. Despite having so many nutrients, this sushi is completely low caloric and suits best to every other healthy diet. A single serving of dragon roll gives you 71 calories. There are only 2 percent carbohydrates in it and only 5 percent of the fats. Whereas proteins are abundantly found in the tempura roll. 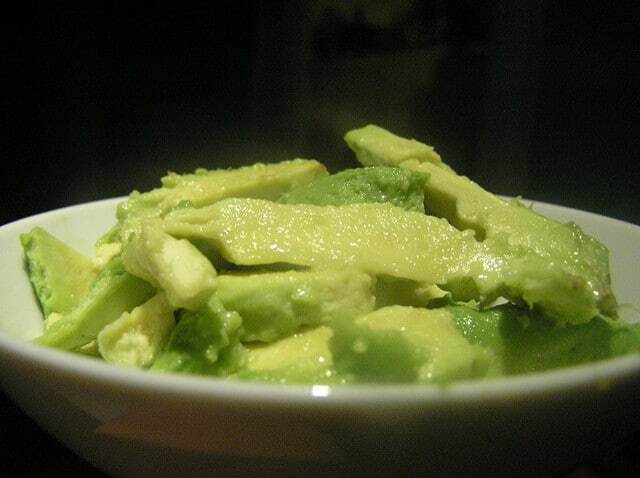 If there is anything which further enhances its nutritional value, it is the avocado. A single fruit contains a balanced mix of every nutrient, vitamin, and mineral your body needs. And the rest of the goodness comes from the cooked unagi and baked shrimp tempura. Here comes the most exciting part of the article where I share the actual recipe with all the ingredients. There are certain ingredients which used raw, and others have to be prepared before. So, I recommend planning the preparation as per the availability of those ingredients. Like if you are planning to make tempura, unagi sauce, and spicy mayo all at home then start one hour before to ready all the stuff for the roll. I usually keep everything prepared in the kitchen and then roll them later together about half an hours before the serving. Fresh ingredients like avocado or cucumber should be sliced at the last moments as they will lose their fine texture and the taste. Other than the cooking ingredients, let me tell what tools you might need to make the sushi. The bamboo mat is a must! It makes the wrapping of the roll much easy plus its surface allows easy handling of the rice layer on the outside. Other than that, keep the plastic sheet to wrap the sushi roll. And use the nozzle bottle to drizzle the unagi sauce at the end, it will give a sharp and clean look to the platter. Slice the cucumber into quarters then remove the seeds. Further cut the quarters in half lengthwise. Keep the cucumber aside. Now come to the avocado! Slice them lengthwise then twist away both the halves. Separate the two halves and stick a knife into the pit and remove it after twisting. Peel the skin of the avocados and slice them further lengthwise. Press the avocado slices in a bowl using your finger or with a spoon to turn them into such roll or nori seaweed length pieces. Toss the avocado with lemon juice. It will keep the color of the avocado fresh if you are not serving the roll immediately. Cover the bamboo mat with plastic wrap and spread half of the nori sheet over the mat, by keeping the shiny side of it down. First, dip the hands in the vinegar water and spread those ½ cup sushi rice over the nori sheet. Now turn the sheet over gently, and place the shrimp tempura, tobiko and cucumber strips at the bottom end of the sheet. If you are using the unagi, then place it inside at this stage. Start rolling the nori sheet tightly from the bottom end while rolling the bamboo mat. Roll the bamboo mat over. Tightly squeeze the roll and top it with the avocado. Wrap the roll in the plastic wrap and put the bamboo mat over it. Squeeze it again to press the avocado slices over the sushi. Be very careful and gently while handling the avocado slices, do not break it. Use a sharp knife to slice the roll into 8 pieces. Continue cleaning the knife with a paper towel after cutting each slice. Squeeze the roll tightly to avoid messing the shape while cutting it. gently remove the plastic wrap from the sushi slices and place them in a serving plate. Top the sushi with tobiko, spicy mayo and black sesame seeds. Drizzle some unagi sauce on the plate to serve the sushi with. Your ebi tempura roll is ready to serve. Inside out sushi roll with rich stuffing and the juicy avocado topping, can instantly make your day. Dragon roll, besides its cultural and culinary significance immediately makes a person fall for it due to the epic combination of the sushi rice, nori, tobiko, unagi, and shrimp tempura. To spice things up, the seasoned mayo is the perfect drizzle over topping. I can bet you may never have tried this super-rich sushi roll in your life, there is a reason it is known as dragon roll, and now you know it!